Do you know what's bad about disposable shopping bags? Everything. They are flimsy and sometimes break (leaving you chasing produce down the sidewalk), they end up in landfills getting eaten by dimwitted seagulls, they cut into your hands and wrists, and they take up space in your house if you feel to guilty to throw them away (because you like seagulls). Bad, bad, bad. 1. they are very sturdy, so you can fill one with a six-pack of (um) seltzer, and then put your eggs right on top, and not worry about it breaking. 2. They make you feel like you are doing your bit to save the environment. 3. They aren't just for groceries- I take them to the drug store and the hardware store, and I have started carrying one in my purse for impromptu shopping trips. 4. They go over your shoulder, which is a lifesaver when you're carrying tons of groceries up four flights of stairs. 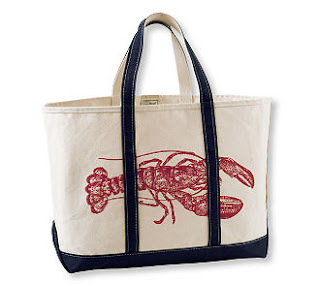 The LL Bean canvas bags (about $30), shown above, are classic, washable, insanely durable (I think my parents have one from the 40's in our basement in Michigan). You can choose your favorite colors, and have them monogrammed (or personalized with tags like "meat", and "veggies", if you're organized like that). The Reisenthel line of bags (about $8) is made of lightweight ripstop polyester, and fold into their own little mini-bags for your convenience. 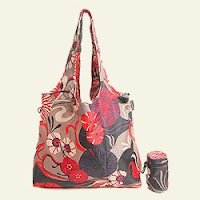 They (and many other great options) are available at www.reusablebags.com. 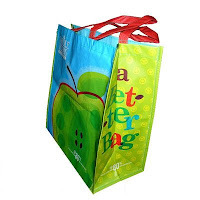 Of the bags sold as grocery stores, Whole Foods' Better Bag (99¢) is really great. It's made from recycled soda bottles and feels kind of flimsy, but I've had several for over a year and they have held up amazingly. I prefer the larger size, because the straps will go over your shoulder. 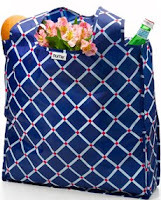 I also love these RuMe bags (3 for $29), which are actually cute and can hold up to 50 lbs. I tend to prefer bags that don't shout with slogans like "I'm so Green", which feels sort of smug and self-satisfied, and rings of the user trying to get credit for their bag from all random passersby- so these pretty patterns are right up my alley. Stylish, comfortable, convenient environmentalism? It's in the bag.